"These are delicious, easy, quick, and so versatile! Eat them plain, topped with your favorite spaghetti sauce, or sliced on a Caesar salad." Preheat oven to 400 degrees F (200 degrees C). Line a baking sheet with aluminum foil and spray with cooking spray. Whisk bread crumbs, Parmesan cheese, paprika, salt, and black pepper together in a shallow bowl. Stir butter, white wine, mustard, and garlic together in another bowl. Dip each chicken breast half into melted butter mixture; press into bread crumb mixture to evenly coat. 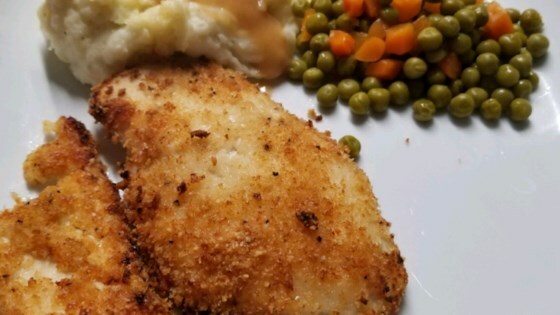 Place breaded chicken in a single layer on the prepared baking sheet. Pat any leftover bread crumb mixture onto chicken breasts. Bake chicken in the preheated oven until no longer pink in the center and the juices run clear, about 20 minutes. An instant-read thermometer inserted into the center should read at least 165 degrees F (74 degrees C). Watch this closely, the breading browns very quickly. I liked the addition of the Dijon mustard. Pretty darn good! I used chicken tenders, so the cook-time was even shorter, and everyone liked them! Definitely a do-again! It was terrific! I made it exactly as the recipe is, I wouldn't change a thing. The chicken was easy to make, tender and had great flavor! I will definitely add it to my chicken recipes. Thanks! Great tasting and super easy to prepare! Even my four year old daughter licked her plate. I am HOOKED! We loved it and it WILL be a staple in my house! THANK YOU for this super easy, minimal effort and time saving recipe!